phototherapy, pulsed electromagnetic field therapy, electrical stimulation and therapeutic ultrasound to compliment the manual treatments. to ensure the animal maintains or returns to its optimum health. Muscle elasticity is fundamental in the movement of horses no matter what their discipline as it allows for more controlled , quick movements and helps to prevent muscle pulls and tears. Assessment of flexion and extension of all muscle groups will indicate where muscular improvement and development is needed and provide information on where specific training can re-educate the lacking muscle groups and promote a balanced gait. Phototherapy is used for the treatment of wounds. The machine used emits Ultra-violet and Infra-red rays which have differing effects on the wounds. This form of therapy makes the treatment area un-inhabitable to bacteria therefore preventing the development of infections which can lead to further problems. treating chronic low grade infections such as mud fever, granular licks, rain scald etc. Star Eastwood, 10 year old thoroughbred gelding. Injury believed to have been caused by impailing himself on a fence post resulting in deep muscular trauma and swelling. Infrared phototherapy was started 7 days post injury and continued until the margins of the would were closed, strong and unlikely to breakdown. Snowy Dovey is a 3 year old terrier cross who was attached by another dog whilst out walking. Snowy picked up by her back end by the dogs teeth and shaken vigourously. After surgery Snowy received intensive phototherapy using the red light laser for 23 days. Red light therapy is also very effective in the treatment of wounds that have failed to heal by first intention. Electrical currents applied externally encourages skin wounds and bone fractures to heal more efficiently and with less change of reoccurrence of injury. This method has multiple frequency settings, which enables the successful treatment of physical and emotional pain. This method can not be used if the patient is pregnant, may have infection of any kind and where growth plates are still open or the laying down of new bone would counter productive. Electrostimulation has proved successful in the treatment of pain and helps to promote healing. 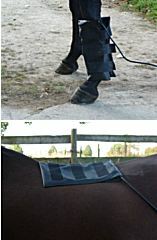 Electrodes are applied to the skin over the motor points, and deliver low voltage, pulsed stimulation to surface nerves. Ultrasound is a form of acoustic energy and is commonly used to treat musculoskeletal injuries. Ultrasound acts as a deep heating agent and can produce temperature changes in tissues as deep as 1 - 5 cm (muscles and tendons) without causing damage to superficial tissues such as skin. and aid the muscle repair. Significant results are being seen after just 4 days of treatment. Ellie is a 20 year old Irish Cross mare who developed a sudden onset of lameness. After a referral to the vet she was diagnosed with a ruptured check ligament in her right fore. August - Good evidence of healing with the darker area less apparent and more organisation of fibres. November - Very little evidence of original core lesion and well organised fibre patterns. Following identification of the problem and relevant treatment, implementation of a rehabilitation programme is also an area we work in.